A new online video of Alvin Greene is making the rounds on YouTube. (CNN) - "Alvin Greene is on the Scene" - a clever YouTube mash-up honoring the South Carolina Senate candidate - might just be the political jam of the summer. The catchy video ("When I say Alvin, you say Greene!") lays clips of Greene's many television appearances over a throwback hip-hop beat and even takes aim at Greene's Republican opponent Jim DeMint ... in autotune. "November's coming, it's time to choose, and Jim DeMint should be ready to lose," the song rhymes, doing its best T-Pain impression. Multiple news organizations, including the New York Times, said the video is an "official" product of Greene's campaign, but Greene says he had nothing to do with it. "I don't know who made it," Greene told CNN. But that doesn't mean he isn't listening. "It sounds good," he said. "Make sure everybody hears it." It appears the video was created by a San Francisco hip-hop producer calling himself "Satellite High" and uploaded to YouTube by a user called "virgiltexas." Both men promoted the video on their Twitter feeds yesterday, with Satellite High proclaiming: "when i say 'alvin' you say 'dammit you people will believe anything.'" The producer did not immediately respond to an e-mail seeking comment. UPDATE: Jay Friedman, the San Francisco-based producer behind the song, is amused at the attention the video has gotten. The entire concept, he said, was developed among a group of friends "goofing off" on Twitter who had been following the Alvin Greene phenomenon. "I just like making funny music, and a friend of mine on Twitter approached me asking, 'You wanna do this'," Friedman said in phone conversation. "It was kind of inside jokey thing." Friedman said the song took about an hour to complete, with some extra time needed to convince his wife to perform back-up vocals. The video, which was posted on YouTube Thursday, was produced by his friend. He said he was taken aback when the video was billed as an "official" Greene campaign video. "When we were making it, we were trying to make sure there was enough comedy and parody in it so that people would be sure that it didnt come from the Alvin Greene campaign," Friedman said. "People are willing to believe very strange things when they come from the internet." It would be really funny if, after putting this D stooge in place, the R opponent loses. Now the conspiracy theorist that suggest he might be a Republican funded plant, could scarily be correct. They go on to laugh at the Republicans for such an underhanded trick, as well laugh at the possibility that Demint is so corrupt, that Mr Greene might actually become the next Senator of S.C. He will fit right in in Washington. His credentials will stand with the rest. Can anyone get this so called "Greene"out of the site. Remember out of the site out of the mind. He is just there and pretending he is something while he is not. No one knew Greene before, now he is talking while not showing that he is something. Please stop playing with peoples mind. We have more pressing issue to deal with than wasting our precious time in this empty suit Greene from no where! Even the bridge to no where, was known it was in Alaska! Why not vote for Alvin Greene??? He is as intelligent as any Gov. S.C. has ever had....I'd bet a whole lot more honest!!! This guy is the most decent, honest Democrat to run for office in the last 40 years. It is no wonder that the libs are attacking him, he isn't enough of a hater for the Democrat hate party. We need, at least, 50 % of people like Alvin Greene in US Congress. People who have struggled to pay rent, to pay telephone bill, to pay electrical bill, to go to restaurant, and so on. People who could afford vacation, to pay their credit card bill on time, or to have a decent car. Therefore, Mr. Alvin Greene has my vote and my money. Also. I am not sure what people mean when they say that he is an idiot. 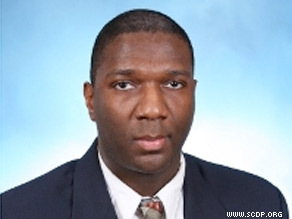 How many people, in this country, with Mr. Alvin Greene conditions could manage to be a US Senator nominee in South Carolina? An idiot could not do it. I am not an idiot, bu I couldn't.. So, somewhere, he is very smart. Please, South Caroline, don't put this dumb in Senate. Turning Alvin Greene into a rappin candidate in South Carolina will virtually hand the election to Jim DeMint. slamming this guy from the get go. believe in free elections (Bush-Gore, Bush-Kerry). star I've seen in the democratic camp in a few years. alot of talk show hosts will be eating crow. Mr. Greene should smile more. He has earned the right o smile. He has the Democrats scratching heir heads in dismay. I haven't heard anything about the "probe" into his primary election. If there was something found it wold have made the news. So Good Luck Mr. Greene. The fine DNC should be overwhelmed with Pride! South Carolina is so screwed! A lying corporate apologist or gumby. Is this the best that the State can come up with? Pathetic. Mr. Greene will get my vote. He's better then DeMint. Has anyone ever figured out how Mr. Green came to win the primary in South Carolina? While he seems like a very pleasant and easy-going man, he doesn't strike me as someone prepared for this important position. Who was he running against? This story seems to have died in the media. In any event if his primary win is legitimate, I wish him all the luck in the world. He will need every ounce of it.